I was sat alone in the large chamber of Lime Street Station when I decided I would actually review the WNWA96, I was tired and hungry and in need of being in my bed, I was done. Before I start and before you read this there are a number of things I should say, the first I am going to get peoples names wrong, I am going to get some of the finer details wrong but this is an event like no other and so I’m going to tell it in the best way I can. It was about 11.45am at Bluewater in Kent, my partner had wanted to return a few bit of a maternity wear to a shop because they hadn’t fitted and I had tagged along so that I could offer the opportunity to eat a dirty burrito. I figured what better way to carb load, I even had the mild salsa to avoid any serious complications in the ‘Paula Radcliffe’ department. I trundled home and started to get changed, everything seemed to be going well and laid my kit in front of me before applying lashings of wholesome Vaseline to almost the entire of my body. 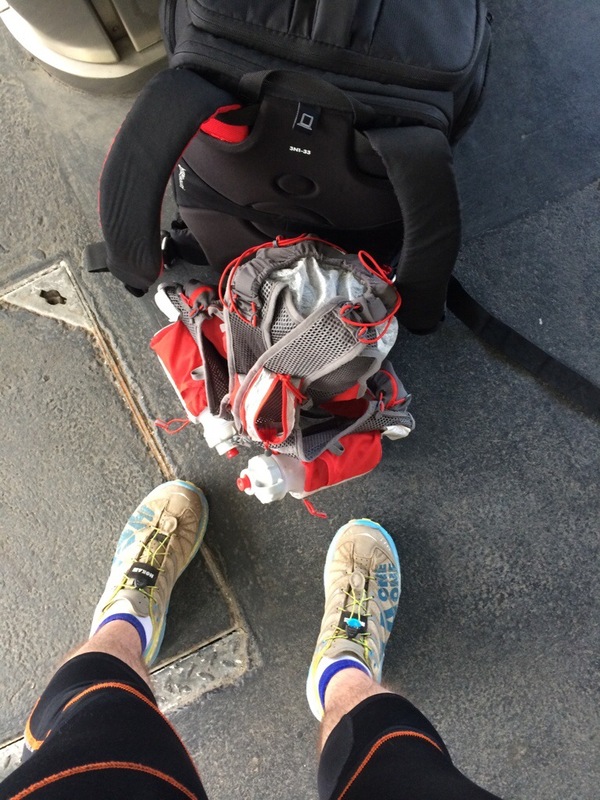 I clipped my Hoka to the side of my bag and headed off to the train station. As we sat outside the station saying goodbye it felt very different from all the other events I do, infact there was a sense of dread about this one and the tension in my face was visible. I kissed each one of my home team, The GingaNinja, UltraBaby, UltraHound and of course Thunderpad and waved them goodbye. I decided I would record the event in photographic terms, uploading them across various social media outlets, but the first would be Instagram and I would update on my progress in the event through blogging, Twitter and Facebook updates. I began snapping away on my rather uneventful journey to Sheffield and after a couple of trains, some short walks, a coach journey, tram ride and taxi hop plus a solid 8 hours in transit I arrived at Hillsborough. I strolled down to the small car park where, in the glare of the lights, I could see the first of many friendly faces I would come across during my journey – Glen from Scoff Events. As I got down the stairs I said hello and he grabbed me a cup of coffee, what a guy. We chatted a little while and it all became clear that we had already met at the Great London Swim where he, myself and my dad had laughed and joked about life and stuff and now he was here making sure that we were all 100% fed and watered. 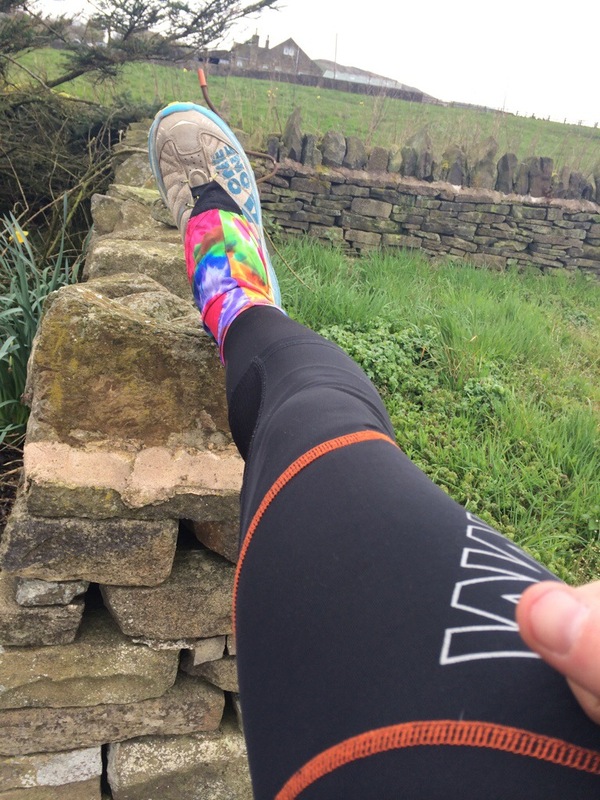 Feeling cheery therefore – although a little cold – I sat down in the car park and started to set myself up, compression sleeves on, buffs on compeed on my feet, Hoka on, water bottles filled, food compartmentalised, Suunto ready, iPod loaded. As I was doing this more and more people turned up including one of the event co-ordinators Cherie Brewster and they all set about the business of doing the things necessary to get us on our way. There was a nice air of relaxed panic about the place as people who clearly knew their places and hat to do worked hard to ensure that everything went off at the right time and in the right place and much of that is down to both Cherie and Steve Kelly whom we had the utmost faith that they would get it right on the day. By the time 11.15 arrived the party was ready to hit full swing and I had the pleasure of meeting lots of lovely people. Gordon, on holiday in the Peak District had come over to support us. Owen, one of the walkers who had come on over from Houston – awesome. Nasher, gentleman, legend, poet and musician. Multiple Paul’s, a Debi, Brian, Des and of course Jimmy, the event mascot. 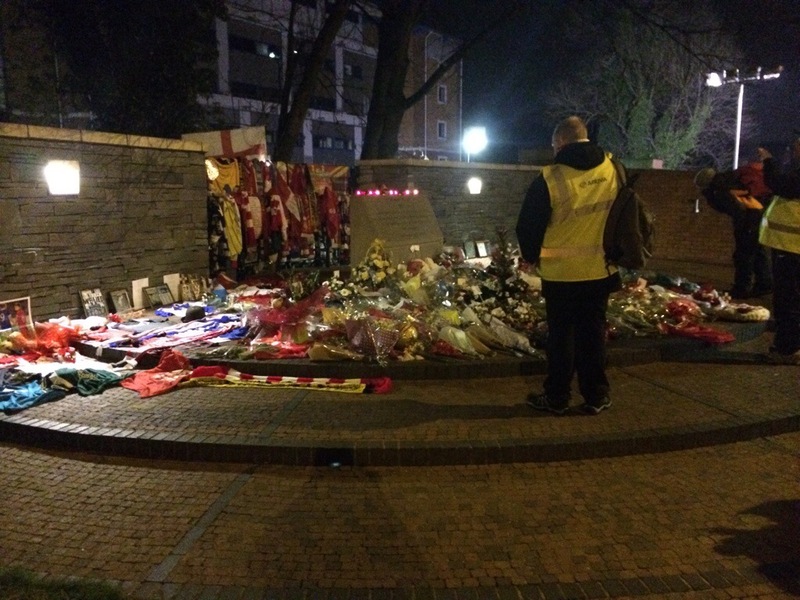 As time was ticking on we were all called over to the memorial at Hillsborough and here would be a reading of the family names and Brian Nash would read a specially composed poem about his feelings on the tragedy. There was a sombre silence as the words echoed around the memorial. Brian read his poem with a beauty and sincerity that brought many to tears – including myself and as I saw my dad again I could see him ready to break down, it was here that I realised that no matter what else this was an event about community and the value of retaining your dignity and humanity. Anyway, we returned to the general fits of giggles and laughs that would become the hallmark of the event, this was scousers on tour, yes it was nearly 1am and yes we hadn’t started yet and yes it was in memory of those who were lost in the tragedy, those who had survived and those who had supported everyone through the years but that didn’t mean we had to be downbeat – this was a celebration of the human spirit. 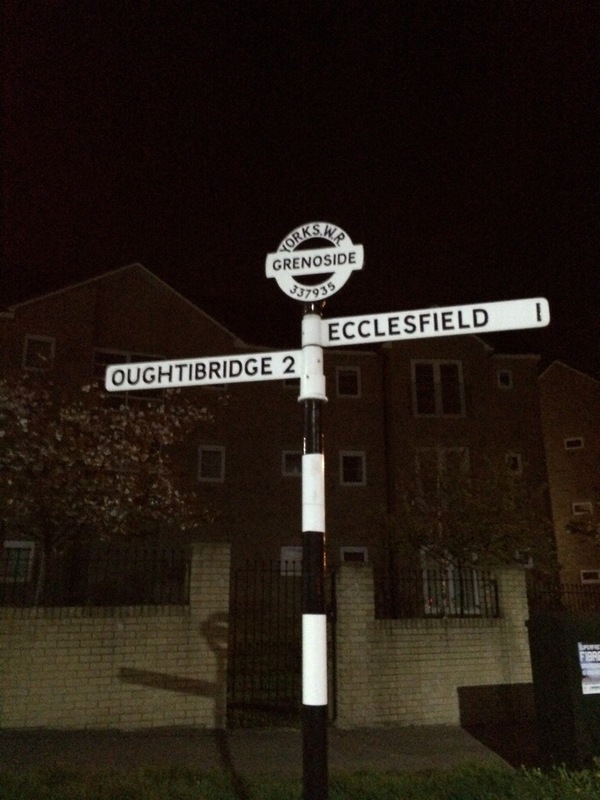 And so at 1am in the cold of Sheffield we set off. The organisers had prepared a couple of support cars with medics and supplies such as water, there was also a sweeper bus that was intended to keep us on our toes for the journey. Unfortunately there were only four copies of the maps to be distributed between most of the walkers, which on the whole was fine but meant for safety purposes it was better to have a photographic copy of your route. However, the support vehicles were never very far away and they helped to guide us – something I would be very grateful of at around 100km in. The group quickly dispersed into several pockets – the first of which had me at the front of it. 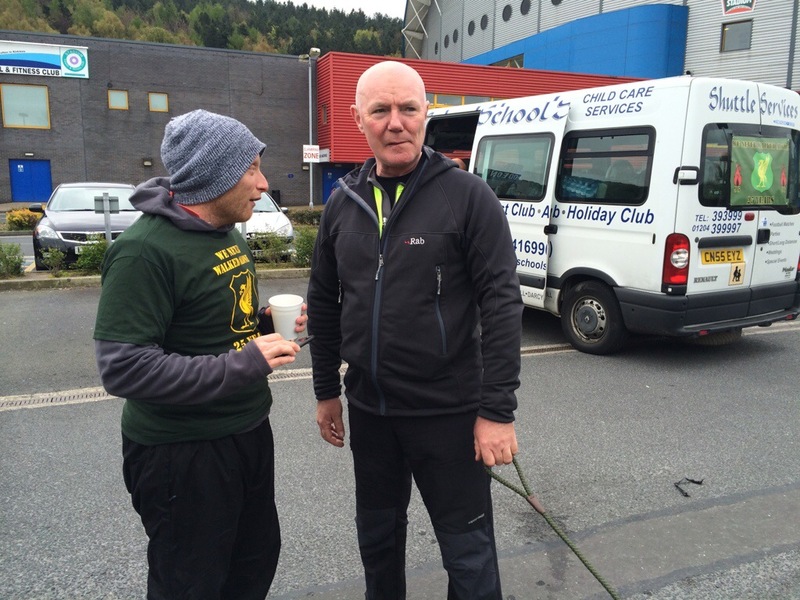 I was joined by two chaps, Ian and Brian – both of whom were survivors of the tragedy and talked a little about the feelings they had and why they were so determined to do this walk. Their stories were remarkable and their pace incredible, especially given their relative ages combined with the incredibly hilly start we had it was a stunningly fast pace we were pumping out. We reached the top of the first hill in great time and slowly but surely I could see that Ian was dropping back a little, I checked over my shoulder to ensure he was okay and with that seemed to be a wave of his hand Brian and I pressed on ahead – safe in the knowledge that there were another 30 odd walkers just behind us. I kept about 50 metres ahead of Brian for a little while as the darkness was all consuming and I needed to focus on my own walk, but I had broken up the lack of light with my own entertainment which was belting out Elton John and Glee songs at the top of my voice, there is nothing like the sound of ‘Don’t go breaking my heart’ with hardly a soul in sight – something quite liberating. Anyway at about the 20km marker Brian finally caught me up as I was keen to take a photograph of the sign for ‘Penistone’ – how true that sometimes the ten year old inside never quite grows out of knob humour. It was probably now about 3am and together Brian and I set off at a fair old pace with the agreed intent of finishing it – the whole distance. For a little while I was feeling the effects of running through the night and at one point felt as though I was actually asleep standing up but then I sa the first signs of day break and we came through a little village and up onto another hill and we were greeted by the best sight of the night – Liz! Liz was the photographer who had been tracking our progress and ensuring we didn’t come unstuck for quite some miles and as she snapped at us I threw her a few of the UltraBoy moves and grabbed my own snapshot memento before moving onwards and sadly upwards! 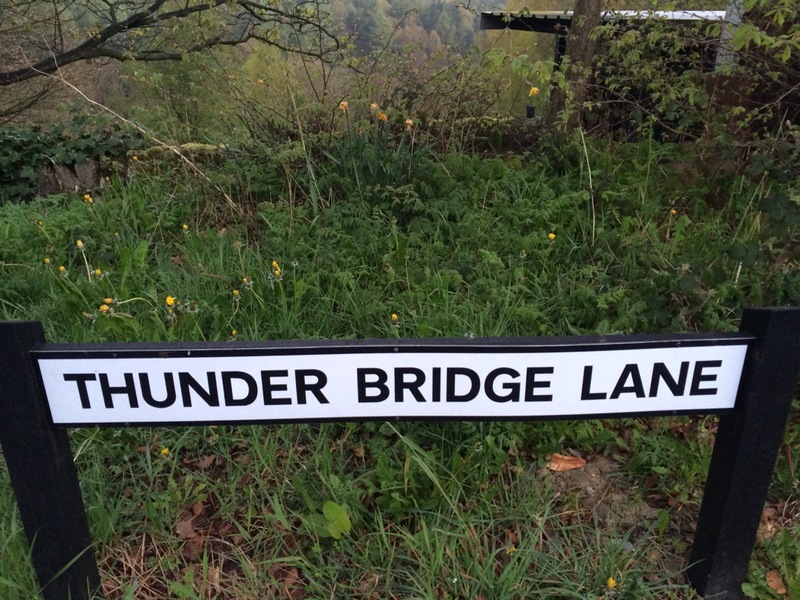 The next few miles passed without incident and as passed by a place called Thunder Bridge Lane even I couldn’t help but feel buoyed by a renewed sense of vigour. This was of course all helped by the arrival of some chocolate croissants and the support vehicles giving us the clear thumbs up as they were sweeping some of the other walkers to the 24 mile point. 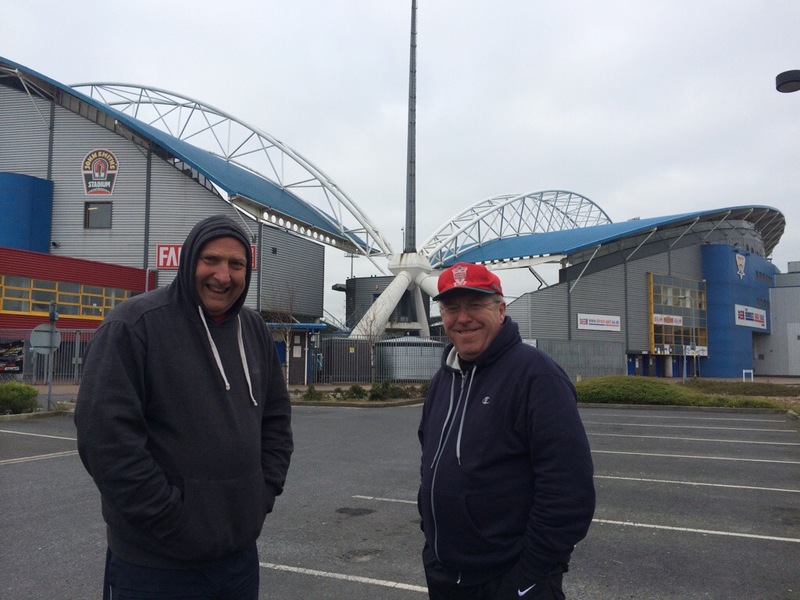 Brian and I descended into Huddersfield in a great mood and in a great time – we were still under 6hrs and even with a diversion and getting a bit lost finding the Huddersfield Town stadium we made it inside 6hrs 20mins – not too shabby. 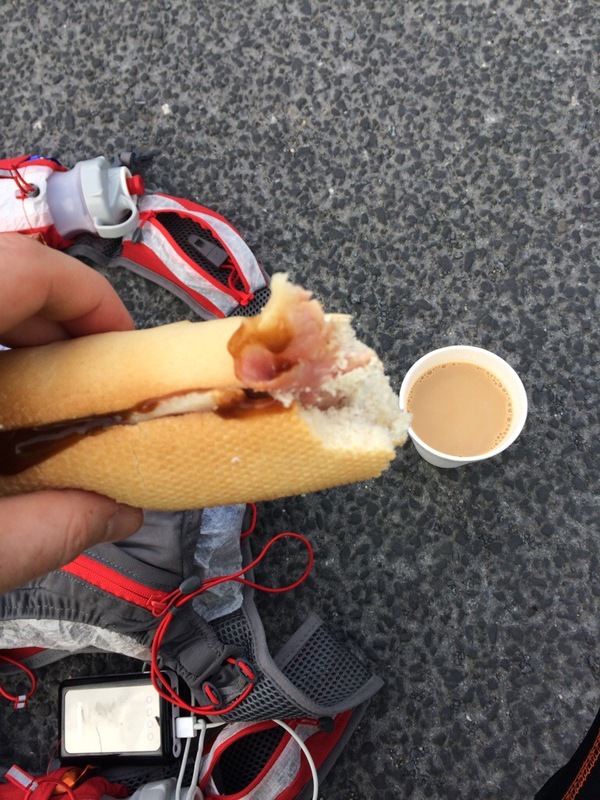 Both Brian and I had spent most of the first 24miles thinking about Bacon sandwiches and thankfully upon arrival there was a tray full of the stuff provided by Glen and Scoff – and scoff it down I did along with about a litre of hit delicious coffee and even more delicious fresh orange juice. This was a significant break with about 90 minutes left for everyone to play catchup and I used this as an opportunity to change from my ridiculously uncomfortable thunder crackers to something more pleasant and also add another tub of Vaseline to my nether regions. The guys at Huddersfield Town were amazing and the grounds people who helped direct us in and the chaps in the sports centre were very accommodating and I can’t thank them enough. I also at this point decided to change shoes and mvdd from my Hoka Rapa Nui Tarmac into my classic and much travelled Hoka Stinson Evo. 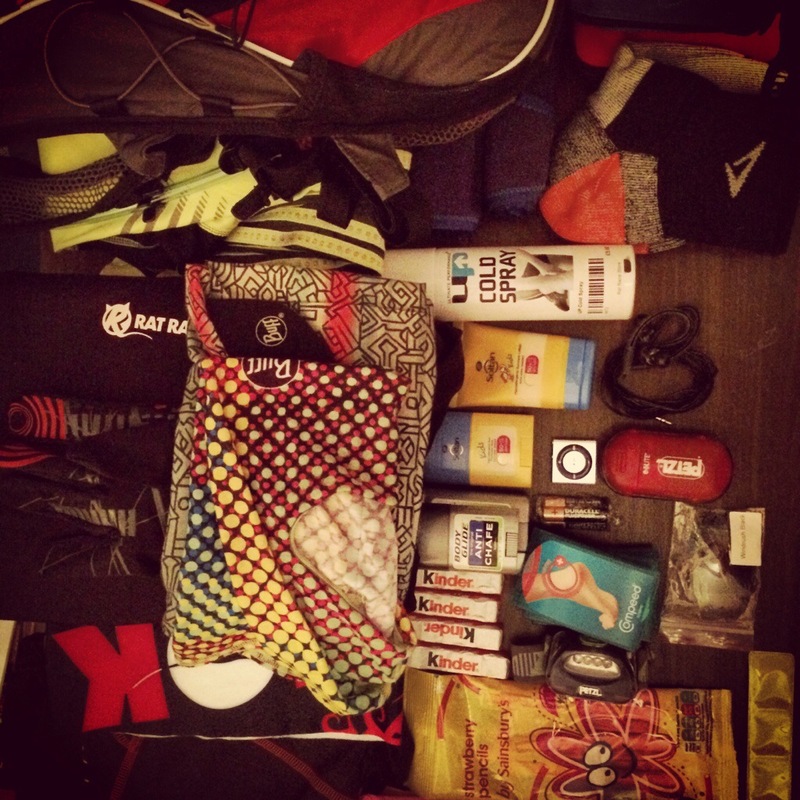 There was something warming about putting on an old friend who has completed thee ultra marathons with you. I used the rest of my time to chat with some of the other walkers who had by now warmed up and were feeling a little more lively, albeit with a few more blisters. I met many lovely people including Tony and Owen and Des (one of the drivers) and also the outstanding Eric who had a lovely ‘feet on the ground’ mentality to the whole thing and declared he was amazed he had managed 12 miles in his Adidas Samba! There was also the coordination of the news reporting and some filming took place but all in all it was well organised here and this helped settle nerves. It was then that we saw legend and all round hero Stevie Kelly come trundling round the corner and despite rumours that he was struggling he looked in remarkably good shape and when both Eric and I went over to join him there was nothing but good cheer as the first 24miles were done. There was a lot of truth in the phrase that ‘theres life in the old dog yet’ and he was living, breathing and hiking proof of it. I tripped and fell – my thigh straight into one of the motorway barriers – sharp shooting pains erupted down my right leg. I quickly thrust my hand down my running tights and checked for blood but it was okay, it was just going to hurt like nobodies business later. We ploughed on at pace, Brian looked strong and for a while he certainly took the lead in keeping spirits high and maintaining the gusto with which we had started. 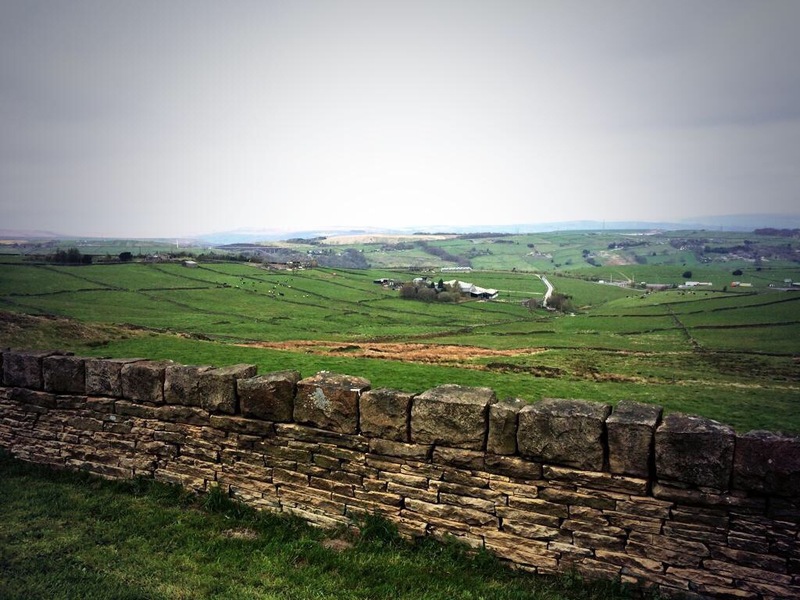 What I knew was that I had to put this to the back of my mind and soldier on for a little while until the pain had subsided and before we reached the next checkpoint I was back in control and admiring the now beautiful scenery between Huddersfield and Oldham. Our composure was fully gained and our tenacity growing as well as our confidence as we arrived at the next checkpoint – sadly there was no support vehicles and no supporters, curious. 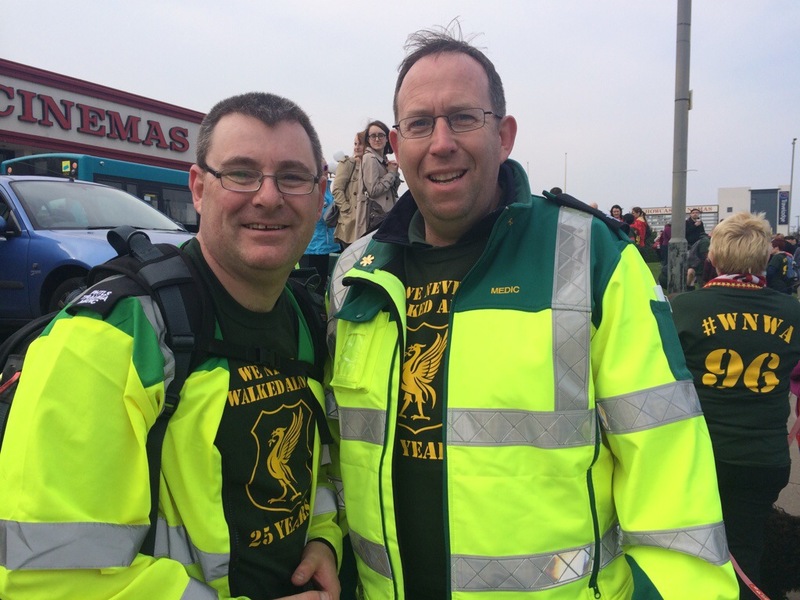 Suddenly the medical guys (Ian and Andy) rocked up and advised us that the bus had developed a problem and there would be no hand over of walkers. Within a minute or two my dad came thundering in and advised us that we should keep going and that some of the other walkers would do the next leg and more would join as soon as the bulk transporter was operational again. For the first time I felt a weight of expectation on my shoulders – that we, Brian and I would just continue, so with a map photographed and a straight run to Oldham ahead we picked up the pace, waved a cheery hello to the other walkers who had managed to reach this stage and then flew onwards into the highly exposed and therefore windy hills. Brian had made the unwise decision to strip himself of his bag and extra clothing at Huddersfield and therefore was feeling more exposed than he needed to. We stopped briefly while I layered us both up with additional clothing and buffs to keep things like necks and heads warm. All of this proved sufficient for us to progress in the cool morning sun and by what would be considered lunchtime things were looking pretty rosy, the bus had passed us and the walkers were back on the road. 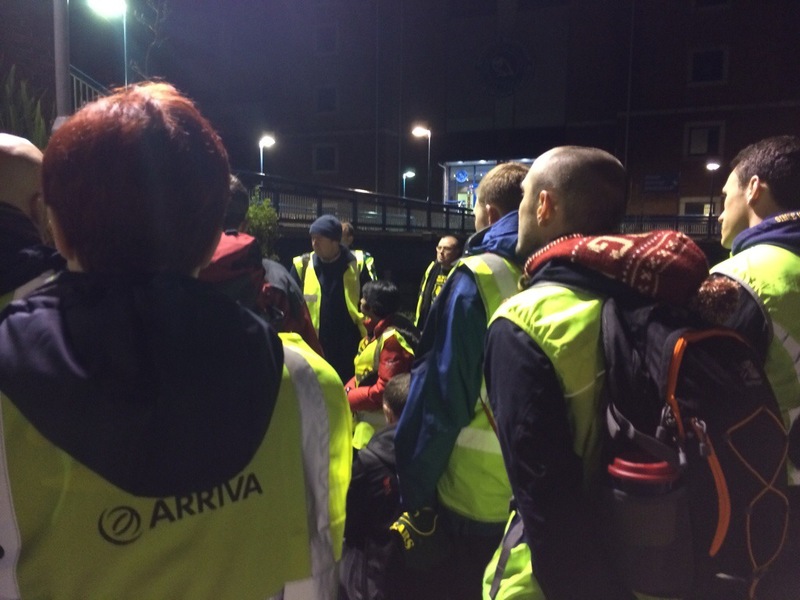 I, of course, being of a competitive nature on hearing that the walkers had been given a half hour head start proclaimed that ‘we’ll have them Brian’ and so from the second of this stages mini checkpoints we hit new speeds in our stride and launched ourselves towards the heart of Oldham. As we came across the hospital I saw the other walkers in the distance and called back to Brian ‘I can see them, lets take them!’ and so we began to run beyond them, giving them an enormous smile as we passed by. I was then in full stretch and I used the opportunity to widen my stride further and give me legs some release from the walking, this paid dividends as I hurtled into Oldham Athletics ground to be greeted by the grinning face of Desy the bus driver. Oldham was a bit of turning point for people I think, firstly there was a major stop – physiotherapist, hot food, rest, sleep for some and secondly it was a bit of a dawning for some that the road was coming to an end and that they needed to conserve their energy for supporting those that were going to continue walking or to save their energies for later on the route when it would be more important to have a visible presence. Both Cheri Brewster and Steve Kelly showed optimal skills in the division of labours – for my mind Steve (or Dad as I usually call him) organised the human element, people and Cheri dealt with the logistics, this provided, for those that wanted it, the respite needed for the upcoming assault on the final 50 miles. The other big plus was that Oldham Athletic were simply amazing – the show of support they offered was unbelievable with both space and time afforded to this posse of Liverpool fans all making their way home – there was even a cake baked and most were hugely grateful to the two physiotherapists who gave excellent support to aching muscles and relief from blisters. Some bothered with sleep on the terraces, others chatted, I took time to get to know some of the people and discussed many things including impending fatherhood, the art of breaking down time, the relative greatness of Shanks compared to Fergie and lots of other exciting topics. 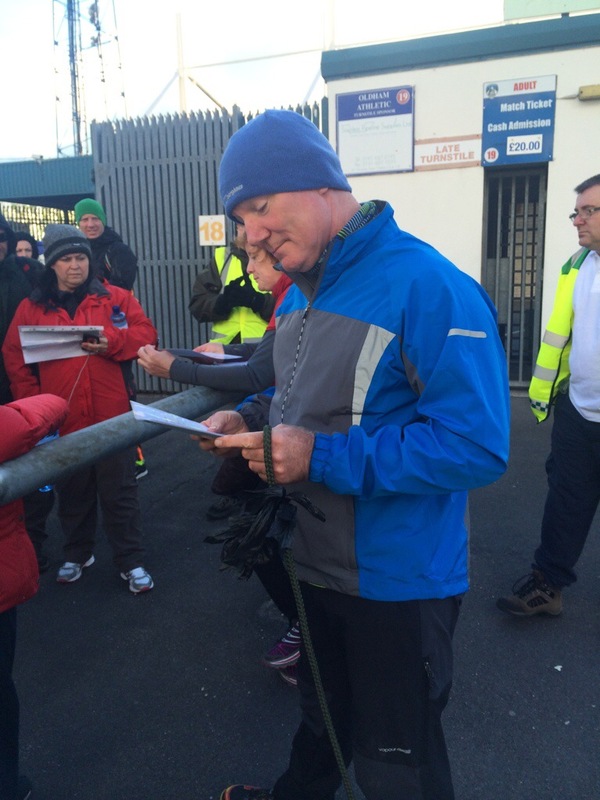 For me personally the break was too long because my long suffering muscles were unable to rest, if I had sat down I know that would have finished me off and so I was required to continue my standing throughout and by the time we were all ready for the off I was really ready. Before we departed though there was a little bit of time for interviews with local radio – including myself – which felt very strange, it seemed that my attempt on the entire distance had not gone unnoticed and I felt rather uncomfortable in the limelight – even if only briefly. However, I was keen to do my bit and so answered as honestly as I could the questions. The thing I found hardest was the question, ‘What would your uncle Mike think about this?’ The true answer was that I had no idea what he’d think, so I went we the only sensible answer which was that ‘he’d think we were all mad, then join us for the last half a mile’. I was also tired when I was interviewed and my emotions were sitting on the surface and I found this hard. Anyway … we were off again … lots of us were off … ace. This time I set off with Brian again and this time joined by Ian (what a guy!) – the Eithad our destination. Once again I took control of the directions and hit the full pelt button, stopping only twice. The first stop was to buy two bottles of Lucozade Sport as I really needed isotonic fluids and the second was to roar with laughter as Chelsea were beaten by Sunderland. That second stop seemed to give us a helluva lift and the walkers as a whole seemed visibly stronger. I found myself making to a little jig and telling our lovely medics that I was made of fairy dust. We pressed on to the outer ring of the stadium and started to make our way round. I waved my companions goodbye as I set off into the distance and around the far side of the stadium, running to the checkpoints was now becoming obligatory. Waiting in the car park was the bus, the walkers and some sandwiches. Yum. I took the opportunity to refresh my water bottles and have a quick chat with my dad who was walking some of the next stage and then I kicked on knowing that time was very much of the essence. As I wandered out of Manchester City’s ground I could see what a behemoth it was and every bit as impressive as I had heard, what was going to be more impressive though was how the event was to turn on its head for me. I was still pretty much with Brian but he was now starting to flag, the soaking he had taken in the first 24 miles looked like it as taking its toll and our latest comrade in arms was keen to push on but was unsure of the way. I had no choice but to mention to the medical team that I was a little concerned about Brian and they simply asked me to keep an eye on him and flag it if anything serious was going to happen – I suppose my main concern was hypothermia – despite my best efforts to get him warmed up, Brian looked cold and I recognised the face he was pulling because I had been pulling it the night before. However, Brian continued, as did the rest of us and then at 99.8km I was called over to the medical wagon. The words echoed hard in my head and I looked at the map. Once more into the breach and with with heart bursting in my chest I flew up the hill towards Bury football ground – passing my waiting dad – who would have to swiftly follow as I hurled myself face first onto the bus. 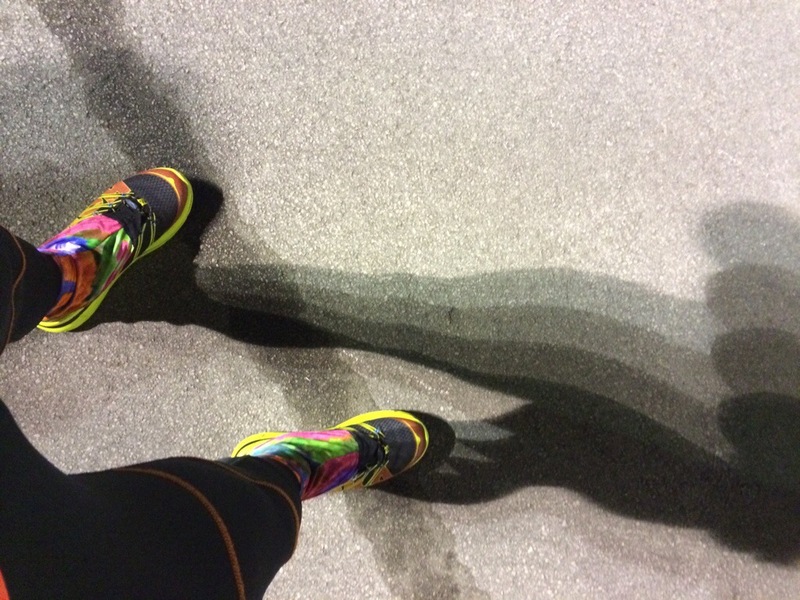 I started looking for a change of shoes – goodbye Hoka and into my Inov8 Trailroc. As I was sat on the floor of the bus there was the sound of cheers and applause and much back slapping but I hadn’t achieved anything yet and I’d lost my hiking buddy. I called out for a couple of bottles of water and my dad passed them to me along with my much needed paper towel to dry the sweat from my feet. I was still in the event and still on for the 96, but I was five minutes behind the other walkers and so with a rod of lightning jammed between my arse cheeks I hit the road again – roars of well wishing greeting my triumphant exit. In the distance I could hear that a medic was being sent to join me to which I could only respond with, ‘if he can keep up’. I bolted down a one way street and then down to the main road, I was being and feeling awesome and in the distance I saw other support vehicle and so slowed down a little bit – engaging in a little bit of a jig as I met up with Paul and a group of walking legends. I’d made it. 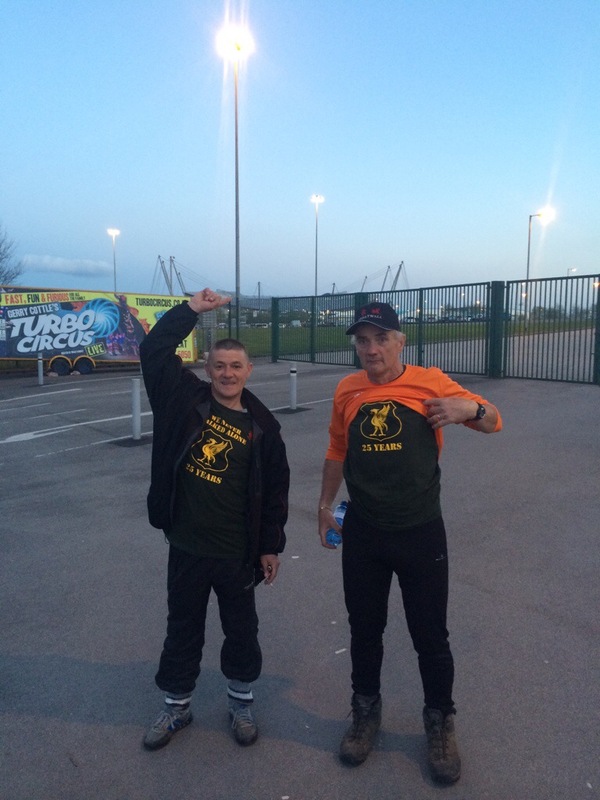 We set off at a respectable pace and where soon joined by ultra running legend Earle Jackson, who only a few days previously had completed the 96 mile Anfield to Hillsborough run. He rocked up without a care in the universe and simply started walking – Earle has the benefit of being one of those guys that is simply amazing and his calm and dignity shone through. And so the group ambled through the roads between Bury and Bolton, the problem was that despite a reasonable pace the timings seemed to be against us, I spoke once again to the medics and was told we were once again on the cusp – I urged the other walkers to go a little faster but it seemed we already had our foot to the floor. I started to run. The medical wagon rolled along side me. Earle rocked up too. In my head I heard the sound of Brian, my dad everyone else who had shared a cheery smile with me this day and it was willing me on as I banged out each step downhill and then every step up the hill to the waiting bus. Here Earle and I were greeted by more whoops but this time it was urgent – the two walkers on the road were 30 minutes ahead of us. 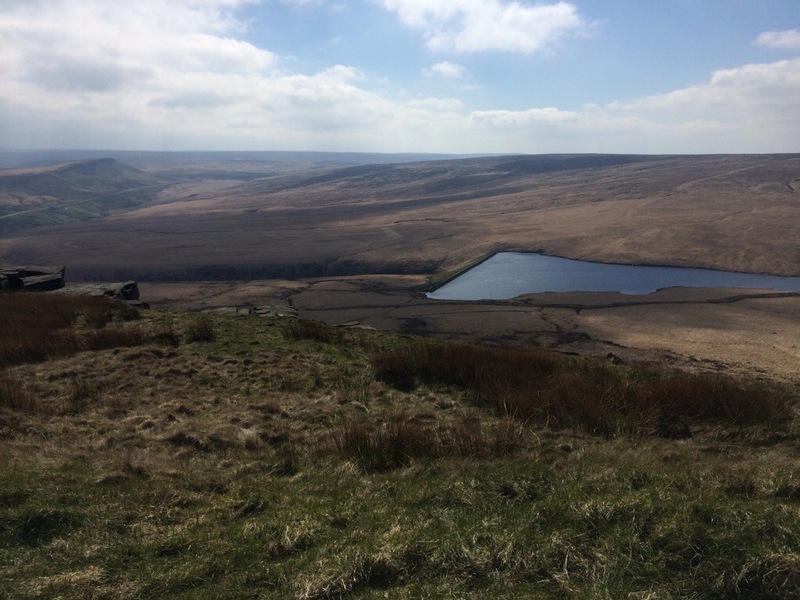 I started to strip down, goodbye warm clothing, goodbye Ultimate Directions PB vest – I was going to run it, but I needed a pacer and support and that turned up in the form of Earle, who stripped down and said ‘don’t worry I can run in my hiking boots’. And off we went and considering our exhaustion and injury status we went pretty well. Bolton was ablaze with the echo of our thundering hooves and as we entered the road to Horwich I knew we were going to make it. Earle had out me back on time and in fact Earle had put the walk back on time. After about 25 minutes of exhausting running we finally caught up to Cheri and Tony and although we stopped and started to hike again we needed to move at a swifter pace than the others because of our lack of clothing, water or anything actually useful. We therefore bid the others goodbye and set off to reach the wonderful Reebok stadium with more than 20 minutes to spare before the next break. At Bolton we were allowed to use the wonderful facilities of the hotel and apparently even grab a shower, I saw people brushing teeth and catching their breath, lying down and catching up on sleep. I managed a brief toilet stop and had a gigantic bacon sandwich along with enough coffee to sink a battleship but time was pressing. I reloaded my running vest, put my warmer clothing back on and layered up to try and avoid bringing my race to an early conclusion in exactly the same way Brian had. I greeted as many people as I could, passing on my congratulations to them because there was so much awesomeness going on that it was hard to keep up. I met some of the new walkers who had joined at Bolton and think I was suitably weird but I’m not sure that mattered now. What I saw though now though was that some of the steel had been eroded from the walkers, everyone looked exhausted, but nobody looked ready to give in. As I stood on the bus packing my bits I saw the lovely Paul who had both of his feet on ice and advised me that he’d be back walking for the final few miles, I saw my Dad who was having his feet strapped up and offered me a thumbs up both as a confirmation he was fine and a need to get reassurance about my own health. Nobody was ready to get off this adventure yet. Wigan arrived and I came across a double yolker of a problem ‘Paula Radcliffe’ time and I had serious sweat rash in my arse crack – awesome. My dad found a McDonalds and I swiftly headed over to it as the walkers moved on, here I was able to have a moments comfort as well as jammed a very tightly packed square of soft toilet tissue between my are cheeks and use that as a buffer – genius. I left McDonalds, purchasing some orange juice as a thank you for the use of the facilities and then set off. 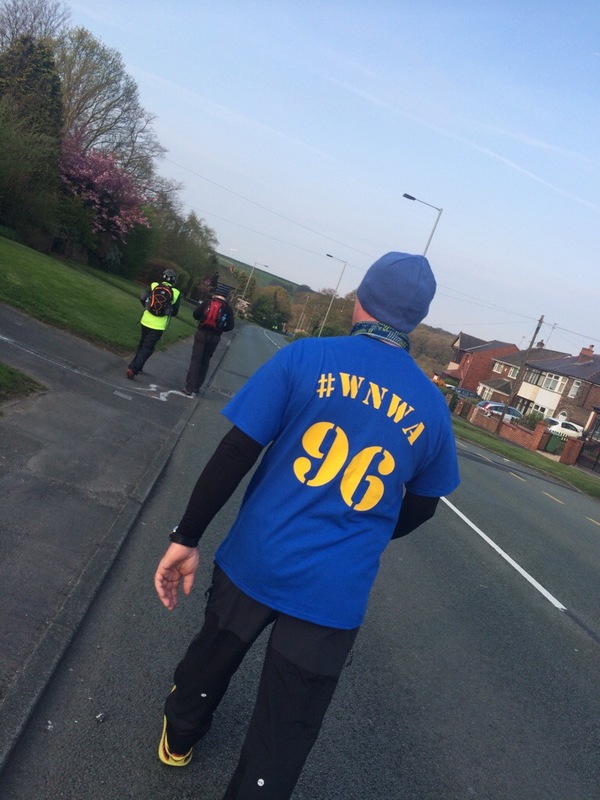 The problem was that I’d been cut adrift from the other walkers and so needed to run the hill out of Wigan. Here I caught up with my dad and then several other walkers but the hills out of Wigan and onto the East Lancs Road were epic and I was really struggling, it was here that my Dad and I finally had a bit of a catchup, he helped me over the hills and more importantly down the hills which were actually the much more difficult thing. Of all the moments that I needed help this was the most important and while I am hugely grateful to Brian and Earle for their huge individual efforts in getting me to those hills, the irony is not lost on me that it was father who guided me over that final very difficult section. We hit the East Lancs Road and I think all the walkers were in various states of dilapidation but were continuing to plod on. Again though we were pressed with the threat of being swept up, with more than 2hrs before we were due to reach the Showcase Cinema we were being ordered to what I had now dubbed ‘the fun bus’ (mainly because Des kept making me laugh). I spoke to my dad and asked if he was capable of at least running to the bus and he said that he was – probably about 2 miles away at this point. In my head I was playing the William Tell overture and I felt like I was the Lone Ranger upon my horse and slowly but surely the sight of Dad and lad started to draw other people into a gentle jog. 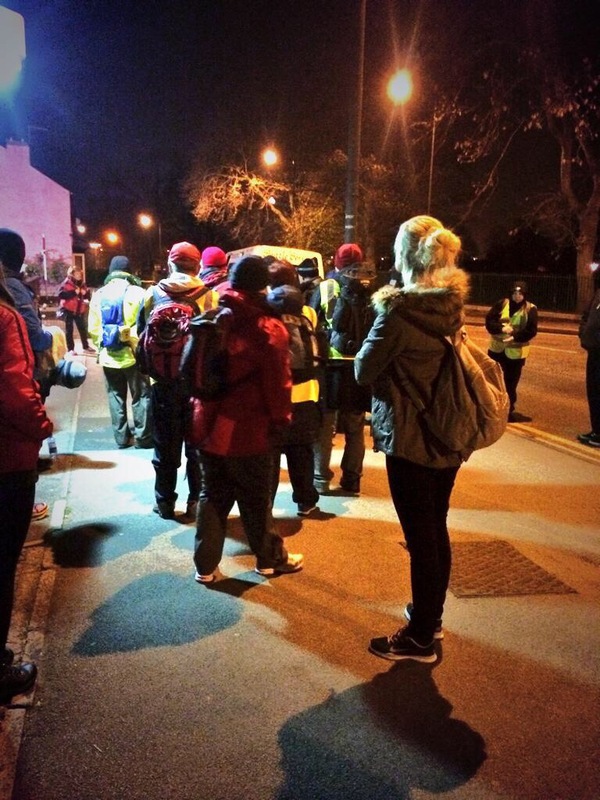 It started to feel like Rocky as we collected more and more of the walkers – we were now the sweeper vehicle, but instead of draining hope we were filling people with renewed energy. I could see the support vehicles and the supporters ahead and my feet took over – blasting their way through the next few hundred metres – awesome. I ran past the bus, knowing that I was likely to be pulled but my dad caught me up and told me to head off, it was here that I was also told that the support vehicles would not be able to stay with me. ‘That’s fine’ was my answer as I turned on my heel and headed out to cheers from the crowd. I ran for a little while and then made a call to my OH, I needed to hear her voice and tell me that it as all okay and for a few minutes we stood either end of a phone crying to each other. She thankfully knew me well enough to tell me that there were only a few miles to go and that I was awesome. She also reminded me that when I am telling the story of the legend of UltraBoy to UltraBaby this will be the story that it won’t believe. It was a long call, probably 10 minutes and in that time I could see the bus had stopped and so I started a gentle jog again and as I got there the bus left and a support vehicle remained but what was also there was the most amazing sight I have ever come across. He just laughed but together we pushed on and before 10am, with about 40 minutes left before the official leaving time I had made it to the cinema. Photographs, hugs, love, there was a massive outpouring both from and to me. Some people though I think thought that was it for me and it really wasn’t and I started out for Goodison Park. 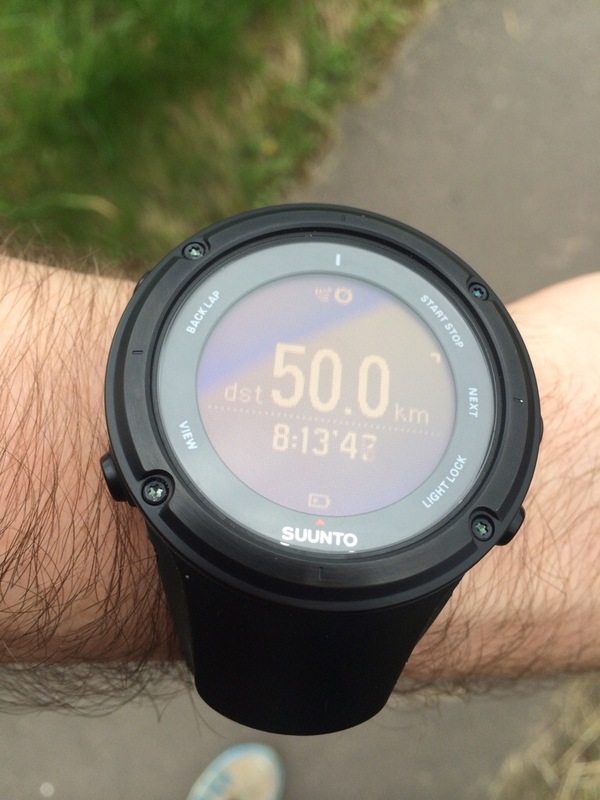 I however, decided the speed was going to be ‘fast’ and so I ran into Goodison Park and collapsed onto the ground. The group was there a little while and I avoided the photographs as I felt as though I had hogged enough of the centre stage and I just wanted to concentrate on the last mile or so. Goodison brought with huge positive feeling and an enormous swelling of pride from the city. 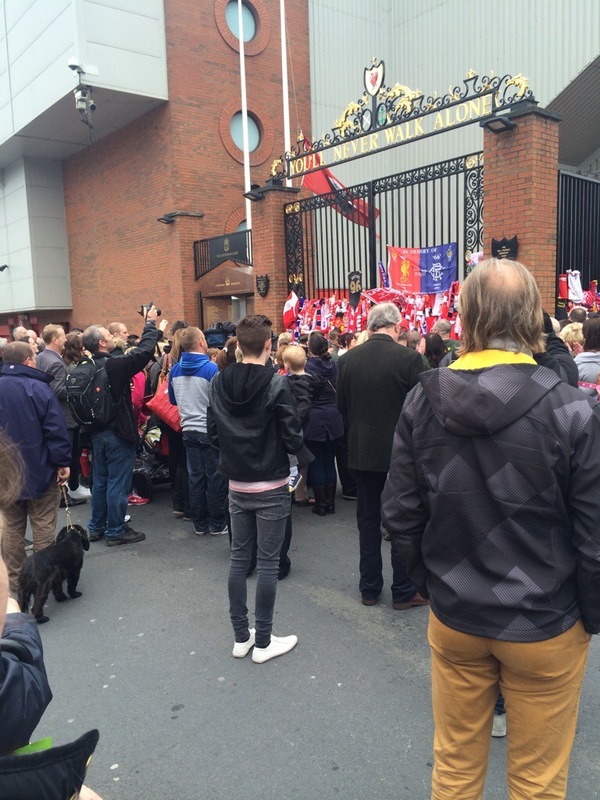 It was here, more than ever, that you could see the immense respect that Liverpool had for the 96 and equally, the survivors. At this point I chatted with a number of the hikers, most notably Ian and Andy the medics and then Brian Nash who had read the poem at the beginning of our epic journey. It had seemed the wrong time to speak to him just after the reading in Sheffield but I wanted while I had the opportunity at Goodison to tell him how moving and how human his words had been to me. He gazed down at me on the floor and there was a moment where I thought we might both burst into tears but thankfully the moment was punctured by the guys from 96 footballs who are preparing an exhibition in honour of the 96 (details can be found at the link below). Anyway our time at Goodison Park was short and we quickly moved on towards Anfield, the home of Liverpool fans the world over. The final leg was passing through Stanley Park, the barrier between the two great football giants and here I again slowed down but this time it was for the purpose of being interviewed, I’m not even sure I was making any sense but I did my best and then plodded on until I met up with a young lady called Terri-Anne (or Nish I think she may have called herself). Feeling rather positive that I was actually now going to make it I suggested that she could help me up the hill by having a little race and so after more than 160km I gave a 100metre sprint up the hill to lick Terri-Anne – poor girl! But I simply couldn’t let her win. Anfield for me came and went, it was all about the celebration of the lives of the 96, the effort of the walkers and the legacy for the survivors. For me it was over, I walked over to the memorial, said ‘Hello’ to Michael and then disappeared into the crowd – waiting until the ceremonies were over. There was a huge amount of congratulations, hundreds of people all wanting to say thank you but for me that wasn’t the point – the point was I was saying thank you on behalf of those who couldn’t. It was an unforgettable experience and there was so much to take from it, lots of positives and so few negatives. A few notes and an opportunity to say thank you. Thanks should go to Cherie Brewster for her organisation prior to the event and during, her commitment to both the walkers and the event was unwavering and I am sure all the walkers will of been happy to have someone like this ensuring they were safe and secure. Earle Jackson will have my eternal thanks for his pacing of me for two rather hilly and significant sections, his contribution to this walk and the campaign as a whole will long be remembered. I have nothing but wonderfully kind words for the Arriva guys, Des and Ian (if I’ve got your names wrong I apologise). These two chaps were amazingly chipper for almost the entire time and you can’t put into words how hard it is to keep your concentration over the time when you aren’t constantly focused – they also worked tirelessly to ensure that there was some transport for the journey, well done guys. The photographer, Liz, who I only saw for the first half a day really but she provided stunning cover for Brian and I as we fought through much of the first 24 miles. She offered a winning smile and a regular thumbs up. All of the support vehicles crews were 100% amazing – these guys who crawled alongside us where pushing their bodies to the limits as much as the rest of us but I’d like to pay special tribute to Ian and Andy. These two guys had the measure of me, they could see my trigger points and whenever I was flagging they came along and gave me a kick up the arse. If I could take only one thing away from this experience then I would take a wonderful pair of friendships with the two guys who made this all possible for me personally. 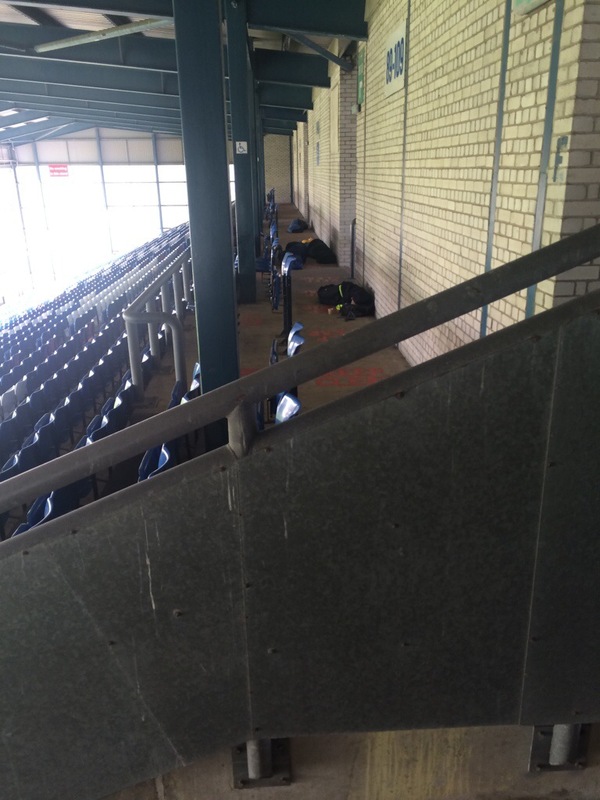 The football grounds deserve huge thanks – especially Oldham Athletic though who opened up their ground and provided space for physiotherapists and food. All the grounds though proved very much that football is about community. And a final thank you – to Stephen Kelly. Well done dad, you done good. Generally the event was well run and the best thing that my dad and Cherie did was get in professionals to help them – with the greatest of respect to both of them they aren’t professional event co-ordinators and they both have a daily lives to lead, so the addition of people like Scoff, the football grounds, Arriva and Home2Office meant that they could focus on the important things like the route and how it would translate as a celebration of the people who have supported the campaigns and the people over the last 25 years. The route itself was hard and 96 miles (actually closer to about 101 miles) of tarmac was hard going even for an experienced ultra runner like myself and while the hills were all manageable there were a lot of them – even at the end and the timings offered little respite which was manly because of Everton’s game against Manchester United on the Sunday. 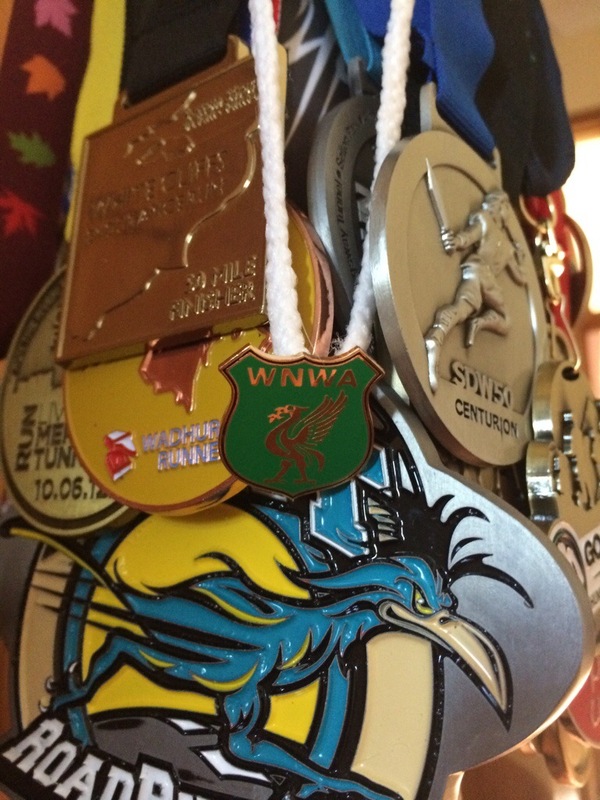 i believe, in hindsight, it would have been better to have reduced some of the rest times and started a little earlier and that way I am confident more would have completed the entire distance. However, this is very much in hindsight and the event was an enormous success and we should pay tribute to all those who played a part. As a tribute to the memory of those who died and those who have survived as well as those who have campaigned this was a success beyond all measure – it has touched hearts and minds all over the world. As a symbolic gesture I can see how the 96 miles we have completed is nothing compared to the 25 year journey in honour of the 96 that the campaigners have endured. I write this now having walked the entire distance and having learnt so much about myself and the tragedy, I am humbled by the people who surrounded me last weekend, humbled by the survivors, campaigners and supporters and I am honoured to have walked a tiny part of this road with you and for you. Thank you. 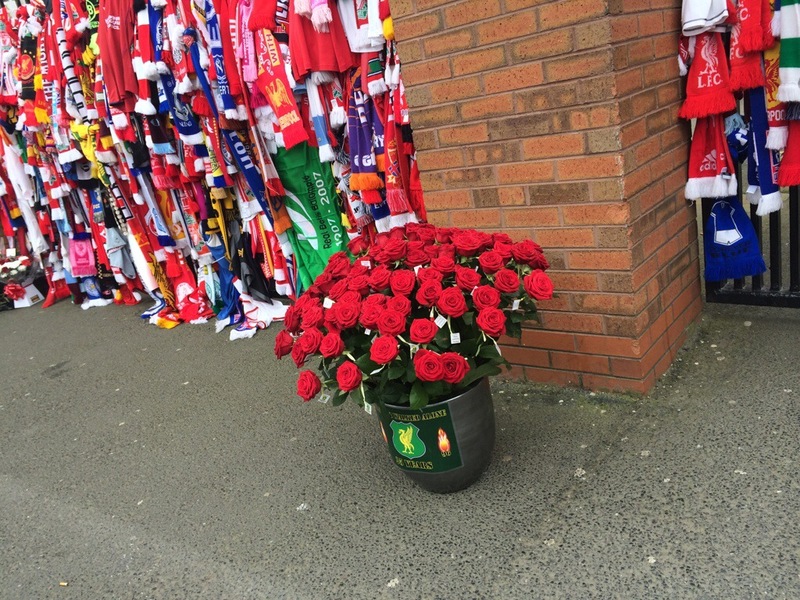 What a great way to mark respect and as a tribute to the 96. Well done.